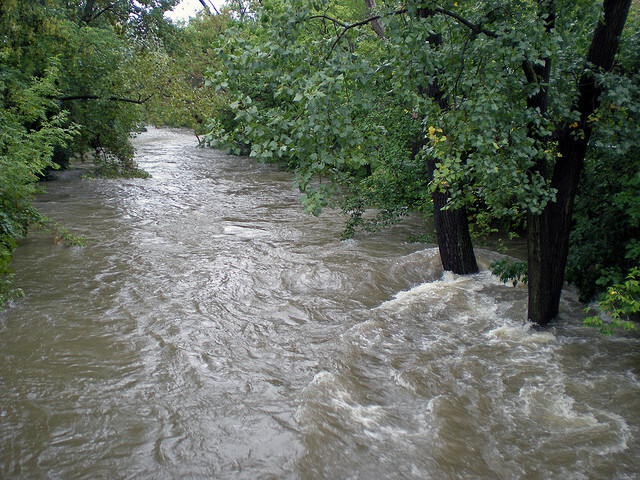 A swollen Chicago River runs through Bowmanville in 2008. Climatologists predict rainstorms will become heavier and more frequent in Northeastern Illinois, but many Chicagoans don’t need mathematical models to know flooding is a problem. Azarina Cerkic, 37, was living in the 5100 block of North Bernard Street in 2008, when a record-setting storm dropped more than 6.5 inches of rain in one day. (That record has since been broken.) The North Branch of the Chicago River rushed over its banks in Albany Park, dumping more than seven feet of water into Cerkic’s basement. Cerkic and her husband had moved to the neighborhood from nearby Portage Park only three months earlier. Worried about the rising water, she said she called 311 on Friday and was told it would be fine. On Saturday the Red Cross evacuated her street. Neighbors who had lived next to the river since the 1970s told her not to worry about flooding, Cerkic said. Like her, many of them did not have flood insurance. Cerkic, who now lives in El Paso, Texas, lost everything in her basement except for some childhood photographs that happened to tangle themselves up in plastic, surviving the water damage and mold. “I’ve had a lot less attachment to physical things since the flood,” she said. Even the most rigorous models cannot predict the future with certainty, but the third national climate assessment released in draft form in January said the Midwest is likely to see a substantial increase in extreme rainfall events as a result of climate change. The frequency of heavy rainfall in the region has doubled since the 1970s, according to the Chicago Climate Action Plan, and the 10 most extreme floods in northeast Illinois all occurred after 1950. State Climatologist Jim Angel cautioned that climate models can be difficult to plan around. He and his colleagues reviewed several models available in 2007 and found widely varying predictions for future rainfall in Illinois. Still, Angel said, the trend is toward wetter conditions. Not only are the annual precipitation totals greater, but heavier events have become more common. Last year’s drought was severe, but 2012 was the exception in a decades-long trend. In terms of overall precipitation, it tied several other years for the 10th driest in Illinois history. Apart from rising greenhouse gases, changes in land-use may also be accelerating the effects of climate change. As more natural landscapes are ceded to development and urban sprawl, hydrologists register an explosion in “impervious surfaces” such as concrete, brick and pavement. Water that once seeped slowly through the soil is instead shunted off into rivers and streams directly as stormwater. Agricultural development also contributes to the rising frequency of extreme storm events. “You couldn’t design a more efficient way of pulling moisture out of the soil and putting into the atmosphere in July than what we’ve got with the corn and soybean crops,” Angel said. While the Metropolitan Wastewater Reclamation District prepares to release a watershed management ordinance later this year — similar measures have been in place for more than a decade in the collar counties — it is not expected to factor in climate change.